Ice picks, hemp rope and goat stew — not the typical gear most modern climbers would pack for a trek up a mountain. But four amateur climbers did just that when they set out to conquer Bugaboo Spire 100 years after its first ascent. Ice picks, hemp rope and goat stew — not the typical gear most modern climbers would pack for a trek up a mountain. But four amateur climbers did just that when they set out to conquer the ascent of Bugaboo Spire in B.C. 's Purcell Mountain range, using equipment from the 1900s. 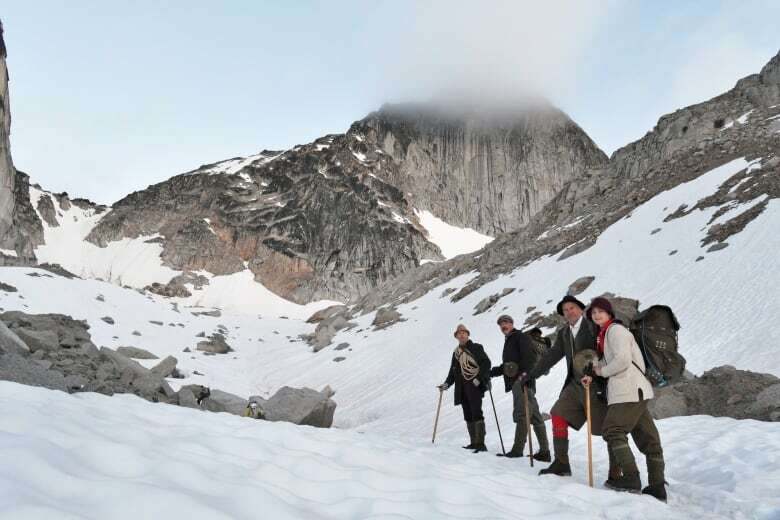 The trek was part of a 25-minute documentary — Hobnails and Hemp Rope — covering the group's re-enactment of Conrad Kain's historic climb in 1916. Originally from Austria, Kain is known for being the first to summit several peaks in the Purcell Mountains, as well as Mount Robson and Mount Louis in the Rockies. "I'm a huge fan of mountaineering history, and the men and women who pioneered mountaineering in Canada in the late 1800s and early 1900s," Bryan Thompson, who led the most recent expedition, told The Homestretch. "I just thought about three years ago, 'I wish I could have climbed in those days.' And realizing I was born in the wrong century, I thought maybe a bunch of us could go and try doing it the way they did back in 1916." Compared to today's equipment, Thompson said "there wasn't very much" a century ago. "The ropes we use today are stretchy and dynamic to absorb the shock of a fall," he said. "They didn't have that. They just had a hemp rope or manila rope that was just braided and they would tie it around their waist with no harness. "No helmets, none of the protective gear we use to anchor ourselves into the rock. And they would have hobnail boots on their feet, wool clothes to keep warm, and that's about it." Hobnail boots had nails and jagged pieces of metal pushed into the soles to give traction on snow and ice. "It was all quite foreign to us, so it was a real learning curve," said Thompson. "The boots fared very well in the snow, they were a little tricky on some of the rock, and the wool clothes took some getting used to." Along with being a lot heavier than the modern kind, Thompson said the backpacks they used were also cumbersome, as they were not yet formed to fit people properly. Staying warm overnight also posed a challenge — with no sleeping bags. "We used wool blankets and we slept on fir branches we cut from trees and laid out on the ground." The temperature got down around the freezing mark, which wouldn't have been so bad, had it not also rained. "We got drenched," said Thompson. "The water just sort of seeped under the tent, the fir branches and wool blankets soaked it up like a sponge, and we basically shivered uncontrollably for three hours and decided — let's just go climb the mountain." 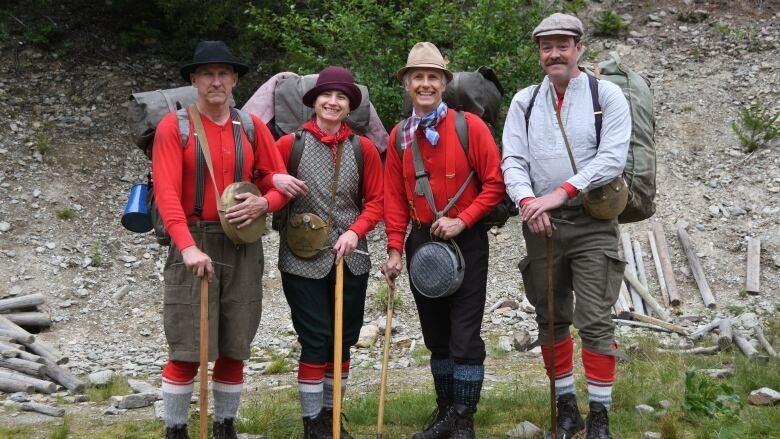 Along with only using equipment available a century ago, the group also ate food from that time period too. "We wanted to make a goat stew. We brought up a couple of pheasants, and we had a lot of heavy foods compared to the light, freeze-dried stuff we use today." 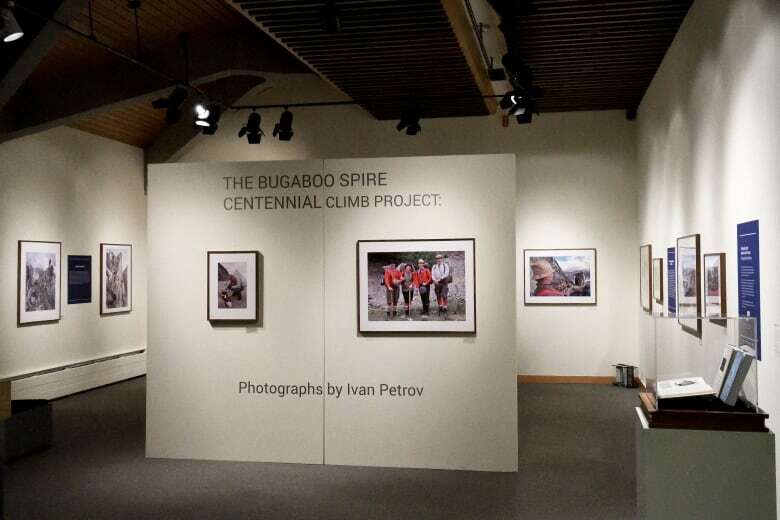 Along with being filmed for a documentary, the trek was captured by photographer Ivan Petrov and is now featured in an exhibition at the Whyte Museum in Banff, running until Jan. 29, 2017.